Pedro Luis Olivares Joyero, along with Tag Heuer, were sponsored of the Porsche Day Murcia event, which took place from June 16 to 18. This event brought together brand owners from all over Europe with the aim of promoting the Region of Murcia. The company offered to all registered to the event a visit to its facilities so that they could approach the different collections of high-watch making available. Among its great jewels is the first smart luxury watch by Swiss manufacturer Tag Heuer, a firm identified with the sporting spirit of risk and speed lovers. 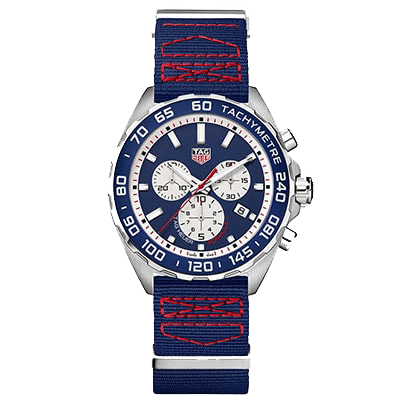 The model chosen to deliver in this special edition of the PDM was the new Tag Heuer Formula 1 Red Bull Racing, the steel chronograph sports the colours of the team (dark blue and red), a combination that alludes naturally to the spirit of competition. This watch, adorned with a bezel with tachymetric aluminium scale in matt blue, perfectly reflects the lineage of the TAG Heuer Formula 1 collection. The events of Porsche Days Murcia are much more than a concentration of vehicles and each year they reinvent themselves and offer to the attendees’ activities of the most fun and authentic. For this tenth anniversary they offered rafting, jet skis, a tour of the gastronomy of Murcia and, of course, the Cartagena circuit. The participants lived an unforgettable weekend with their Porsche in the extraordinary environment that offers the Region of Murcia, with a detailed organization that motivated the participation of Pedro Luis Olivares Joyero. Pedro Luis Olivares Joyero supposes the excellence in the sector thanks to its more than 50 years of work and experience. The company was founded in 1956 by José Olivares and Manolita Cano with an artisan jewellery workshop that gradually grew to later give way to an establishment selling jewellery, silverware and gifts. With time and good work, the company was growing and its four children, including Pedro Luis, learned the family job in 1984 to take over the business. Together with his wife, Teresa, they turned the business around modernizing it and offering the most avant-garde jewellery and watchmaking firms of the time, where quality and service are priorities. Two of her children, Isabel and Alejandro are the inheritors of this family tradition, and they do so with enthusiasm, totally identified with the principles of excellence they have received from their parents. Currently Pedro Luis Olivares markets the best worldwide brands of jewelery and watchmaking: Rolex, Breitling, Hublot, Omega, Ulyse Nardien, Tag Heuer, Tudor, Longines, Hamilton, and others ... almost all of them are distributed exclusively for the Region of Murcia. With a family atmosphere and nearby, it has two establishments: one located on Avenida Constitución, 4, and another on Gran vía Escultor Salzillo, 15. For more information, visit www.pedroluisolivares.com. Tag Heuer is a brand linked to motorsport, and in 1914 made their first chronographs equipped with the famous oscillating sprocket, patented by Tag Heuer in 1887 and used by many mechanical watches today. In 1969 Heuer launched the Caliber 11 or Chronomatic, the world's first automatic chronograph, with a microrrotor that is integrated into the Carrera, Autavia and Monaco. Tag Heuer gains repercussion from the movie 'Le Mans' where the protagonist Steve McQueen takes the legendary TAG Heuer Monaco automatic chronograph with its box in square shape. As a novelty, this model incorporates a technical fabric strap that gives it a sportier appearance with red stitching inspired by the safety belts of the seats of the cars. The chronograph movement of quartz enjoys a precision of a tenth of a second, an indispensable feature in a watch designed for motorsports.